Eating salmon may be one of the best things you can do for your health but you need to understand the best sources. Foods that have an incredible array of health benefits that go well beyond just their nutrient value are considered superfoods. These foods are typically loaded with a combination of critical fatty acids, anti-oxidant phytonutrients and essential amino acids. Wild-caught salmon found in non-polluted waters is an extraordinary superfood. 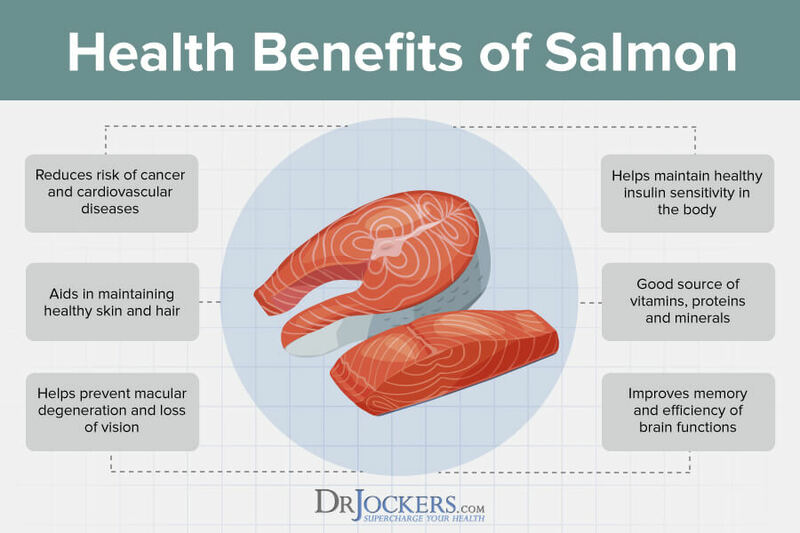 Here are 9 health benefits of eating salmon on a regular basis. Wild salmon is rich in long-chain omega-3 fatty acids that are essential for healthy neurological and cardiovascular function. Astaxanthin is a unique carotenoid anti-oxidant that gives salmon its pink color. This phytonutrient is produced naturally in specific algae that pass on its free radical scavenging effects to the sea animals such as salmon that eat them. Wild salmon naturally feed on red algae and accumulate astaxanthin within their muscle tissue giving them their characteristic pinkish-red color. Salmon are one of the strongest animals in the world with an incredible ability to swim upstream against strong currents. Astaxanthin is credited with providing the anti-oxidant protection that gives them the amazing strength and endurance to swim up rivers and waterfalls (1). These algae also provide the salmon with the raw materials to produce the long-chain omega-3 fatty acids EPA & DHA. Wild salmon also contains the full spectrum of essential amino acids necessary for cellular repair and optimal immune function. The greater the percentage of micro-algae in the salmon’s diet the more concentrated their astaxanthin and omega-3 fatty acids become. The cell membranes within the brain, spinal cord, & nervous system are especially dependent upon fluid based membranes for proper signaling and neurotransmitter dynamics (2). 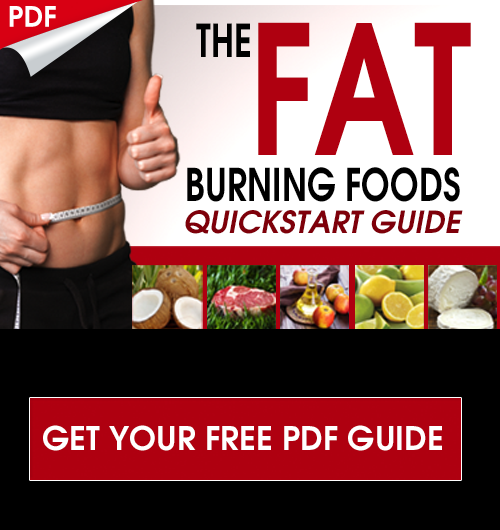 The brain is made up of 60% fat and 10-15% of that is DHA. 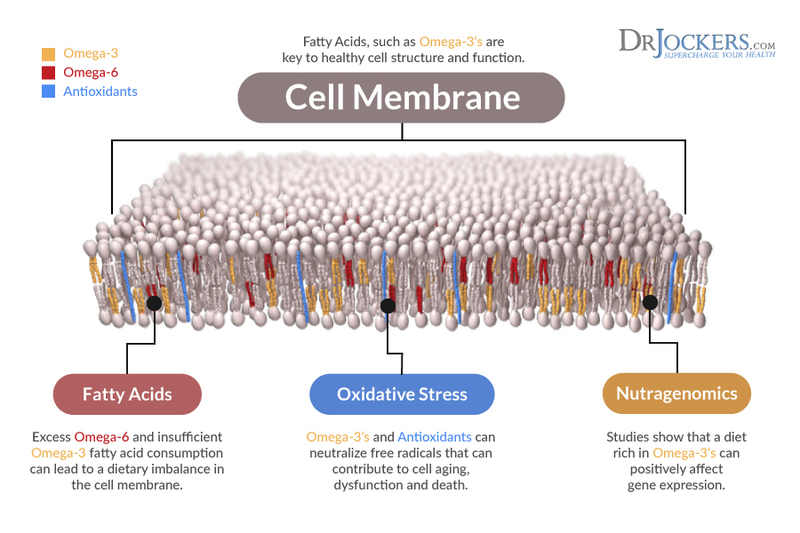 These fatty acids help support the cell signaling processes so the nervous system can effectively communicate. Additionally, they reduce inflammation throughout the body. Optimal brain structure depends upon a healthy array of saturated fat and cholesterol on the membrane to hold the fluid based fats tight at the corners. Then a load of EPA & DHA in-between the solid structures to give it a great level of fluid mobility. 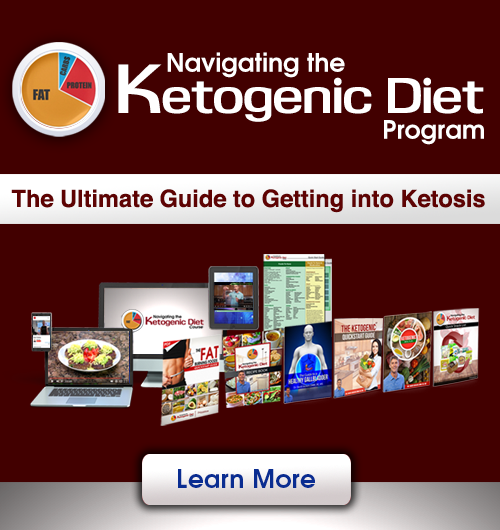 A diet that is deficient in saturated fat, EPA, & DHA is very dangerous for the nervous system. Numerous studies have indicated low levels of omega-3 fatty acids such as EPA & DHA in individuals with learning, memory & neurological disorders as well as mental/psychotic issues (3, 4, 5). People who consume wild-caught salmon regularly have significantly lower levels of these disorders and have less inflammation throughout their bodies. Farm-raised salmon are fed genetically modified grains and dead animal parts. This is unnatural but inexpensive feed. The result is a sick fish that comes out with a grayish-white flesh. These fish are deficient in omega-3 fatty acids and astaxanthin (6). In order to make it look a more appealing pink the fish farms use synthetic astaxanthin that is produced from toxic petrochemical sources. This chemical based coloring along with the toxic feed and medical interventions such as anti-biotic treatments are why the majority of farm-raised salmon is highly toxic. 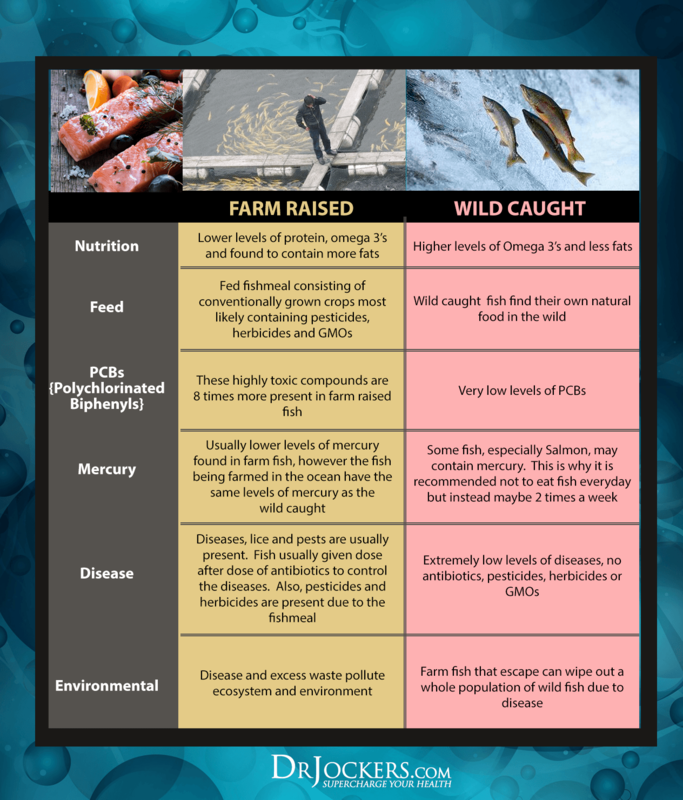 Research produced by the Environmental Working Group in 2003 showed that farmed salmon were contaminated with high levels of polychlorinated biphenyl’s (PCB’s). The numbers indicated that farmed salmon has over 16 times the amount of these carcinogenic chemicals than wild salmon. Many researchers believe that farmed salmon consumption poses an increased cancer risk due to the low-quality nutrients and high amounts of PCB’s (7). Make sure your salmon is wild-caught from the less-polluted Alaskan waterways. The Alaskan salmon has been shown to have the lowest chemical residue. Avoid farmed salmon whenever possible as it is one of the poorest food choices one could make. When eating salmon, I recommend having dark greens and bitter herbs such as parsley, cilantro or dandelion because those will help you grab up any environmental toxins that may be found in the fish. As you learned in this article, there are many health benefits of eating salmon that far outweigh any possible environmental toxins found in the waterways. Using herbs with your meal will help you get the most benefit. My favorite sources for super pure Wild Alaskan Salmon is through Vital Choice and US Wellness Meats. Check out their links below.